Put the watermelon chunks into the glass side of a Boston-style cocktail shaker . Squeeze in the lime half. Muddle until watermelon has become juice. Fill metal side of the shaker with ice. Pour the glass side of the shaker into the metal side, combine the sides, and shake briskly for 10-15 seconds. Strain the watermelon martinis into chilled martini glasses. Bartender’s hints: We’ve served large batches of watermelon martinis by pureeing 8 cups watermelon (about 1/2 of a medium-sized melon), the juice of 4 limes, and 4 tsp agave nectar in a blender. 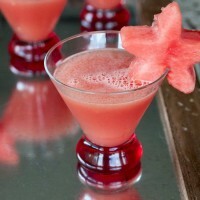 Fill a large shaker with ice, add 4 shots vodka and 2 shots Cointreau, top with watermelon puree, shake, serve, and repeat! These proportions will yield about 16 watermelon martinis. Also, you may find you need more (or less) agave nectar, depending on the sweetness of your watermelon. If the watermelon tastes really, really sweet by itself, start with with half the amount of agave nectar. You can always add more!